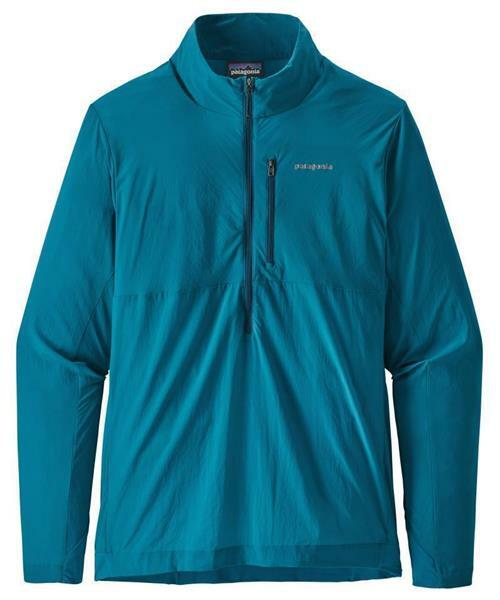 The Airshed became a favorite among Patagonia's endurance testers for delivering on-the-go breathability while simultaneously buffering wind and outwitting storms—it inhabits the sweet spot between baselayer and light shell. Born of discoveries from Patagonia's revolutionary Nano-Air®, the Airshed uses a soft, stretchy, whisper-light 100% nylon mechanical stretch ripstop fabric that helps create a highly breathable and fast-drying microclimate, whether worn over a thin tee or more insulative underlayers. The quarter-zip allows for venting, a zippered chest pocket doubles as a stuffsack (with reinforced carabiner clip-in loop) and the stretch-knit cuffs and hem seal out weather and maintain comfort. With reflective logo on left chest and center-back neck, and a DWR (durable water repellent) finish. Airshed Pullover - Mens is rated 5.0 out of 5 by 1. Rated 5 out of 5 by michaelofarrell from Great for running in the winter! I bought this before the holidays for as a windbreaker for running during cold days in the winter and I absolutely love it. On cold days (0C to -10C) I wear it over a Smartwool 250 Merino base layer and on colder days I add a mid layer. It breaths great and shields the wind. It's also water resistant on snowy days. I can't wait to use it in the spring.